Get inspired with new and interesting ways to design the food you already love. This Halloween it’s our mission to help you find healthy but also creative and spooky snacks for you and your family. These creepy crawly biscuits are not only fun to create but also a great treat for a Halloween party. With just a few small touches you can turn your regular biscuits into super scary spider biscuits the kids will love! Making your own pizza’s is always a nice way to let the kids explore their creative side and make a nutritious meal at the same time. As you can pick whatever toppings you like, it’s also is a great solution for fussy eaters! We suggest you also make it into a Halloween game. Find out which family member can make the best haunted homemade pizza’s. The most creepy, imaginative, bloodcurdling pizza wins! Having problems getting the kiddies to eat their veggies? Creating this masterpiece with them is your solution! Making vegetables fun will ensure eating them isn’t a chore. This recipe is great for not only afternoon activities but also useful for a healthy Halloween party snack. You’ll impress everyone with your creative and spooky treat. Although these cups look like a delicious chocolate treat, you’d be surprised at how healthy they really are. With a few substitutions here and there you’ve made a Halloween snack that is full of calcium and protein, ensuring your little ones grow big and strong. Only a short time to create something spectacular? This is perfect! It takes only minutes to put together and the outcome is something everyone will enjoy. Who doesn’t like Guacamole? This produce-packed snack is perfect for any Halloween party. Everyone will love dipping into this monster designed treat and it’s super easy to make in a hurry. With no chopping or cooking involved, it’s a great recipe to have the kids try and create. Let their creativity go wild! If Frankenstein isn’t the right monster this Halloween, change up the ingredients and create Dracula, Mummy or Zombie Guacamole. If you’re looking for a small icy snack the whole family will love, look no further! These ghostly frozen banana treats are the ultimate combination of wholesome and delish. They’re easy to make with the kids and the end product is perfect for Halloween festivities. With only four ingredients, it couldn’t be more effortless from start to finish. Put those old, brown bananas to good use and create something special this Halloween. We think it’s time for the adults to have a little fun! Halloween should be for everyone right? These Margaritas are sure to kick off any Halloween party with a bang. Throw in some tequila, triple sec, lime and the all important spooky black magic and what do you have? Something delish! Are you brave enough to drink the witch’s heart? Here is the perfect cocktail for your Halloween party or even a nice drink at home. This shimmery drink conjures a feeling of mystery and fear of the unknown. It’s very simple to make and is sure to impress everyone! No time to create individual cocktails? This punch is your solution! Not only does it look fantastic but it’s really easy to make! It is ideal for dessert at any Halloween party and combines all the good stuff; vodka, Triple Sec, pineapple juice, orange soft drink and orange sherbert!. 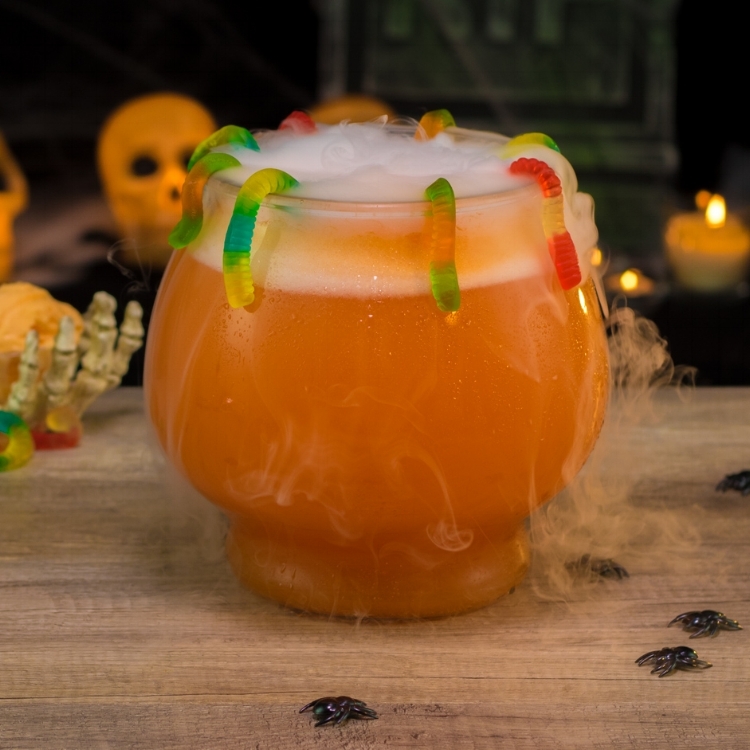 This wriggly worm beverage is spooky and delicious, it’s a must have at any Halloween festivity. This blackberry cocktail recipe is sure to be a hit at your Halloween party! If you love the original mojito, you will find this one absolutely delish! Inspired by a classic poem, it’s the perfect drink to start off your spooky Halloween evening. Rum, blackberries, mint and cranberry juice, what more could you want? Calling all Harry Potter lovers, this one is for you! No witch and wizard party is complete without freshly-brewed Butterbeer. This refreshingly sweet beverage is non alcoholic and perfect for everyone to enjoy. Throw this classic drink into the mix and you’ve got a Halloween party to remember! Having a Harry Potter party? I can’t think of anything better than sitting down to watch the iconic movie with a cold pint of Butterbeer in your hand.